With many wars fought over independence, land, language and even the basic right to exist - Israel always survives no matter the hardships thrown its way. Celebrate this vibrant country with a fighting and enduring spirit with our beautiful Hebrew t-shirt with "Y'israel" written in both Hebrew and English on this vintage design in brown and yellow screen print. You won't find this design on a t-shirt anywhere else in Israel or the world, except here as its an exclusive design made by us especially for you! 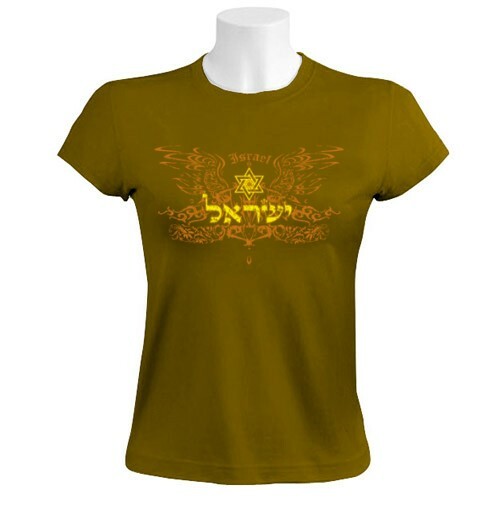 So if you want a unique and stunning way to show your love for Israel, our t-shirt is a must have for individuality and high style! Made from 100% High-quality combed cotton T-shirt. Our t-shirts are made of 100% cotton and are long lasting with bright colors. Our products are all designed and printed in Israel.